“The world is falling apart.” A lot of people have used these words over the last few days. The attack in Germany and the utter destruction of Aleppo are just two examples that we see on a daily basis. Amidst the darkness, let me send you some words of encouragement. Do not let the misery and fear corrupt your mind, body and soul. There is hope. The world as we know it is not ending. Far from it. People of conscience give us hope. 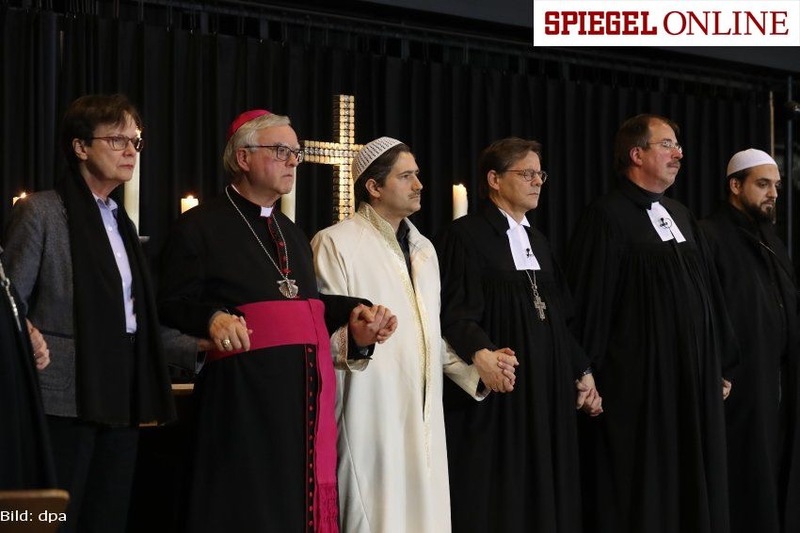 Religious leaders of all faith backgrounds, pictured above, came together in Berlin to show us that extremists will not divide us along religious and ideological lines. These true leaders are not giving the fanatics of all stripes what they want: division. As I mentioned in a Huffington Post article on why Trump’s win is a victory for ISIS, there is a space between “us” and “them” that people (like the ones in the photograph) often inhabit. The grey zone, as Jonathan Freedland notes, is the place between black and white, where nothing is ever either/or and everything is a bit of both. The grey zone refers to the space where Muslims and non-Muslims live together in respect and harmony. The grey zone is the space between “us” and “them.” It is the space of “we.” It is a space of convergence, fusion, and interfaith relations. People of conscience must reject ugly rhetoric and reaffirm unity in our communities. Let us be more like the people in the photograph. Let us engage in honest conversations with one another. Let us break down these unnecessary walls between us. Religion in its original sense is to do with “binding ” people together. It is not about which holy texts or institutions are the most valid. Truth lies among all of these sources and no one has the monopoly. What “binds” us, from whatever religion we take our values – including, too, people of no confessional allegiance – is our common humanity, the common goals we share, the values to which we can agree to subscribe and the understanding that our short time on earth will have been the better for our having lived if we show respect for and compassion towards everyone. I am proud neither to have hurt anyone nor to have not made every effort humanly possible to meet my fellow men and women “where they are at”. "The Qur'an carved out an area of women's rights unparalleled in the 7th century," notes Gary Wills, a Christian & Harvard scholar. Indeed, the Islamic holy book confronted ignorance & ushered in progressive practices. Excellent video by the Emir-Stein Center.